The Honorable Minister Shirley Bond, Minister of Jobs, Tourism and Skills Training and Minister Responsible for Labour with many of the tradeswomen who attended Youth Day 2016. 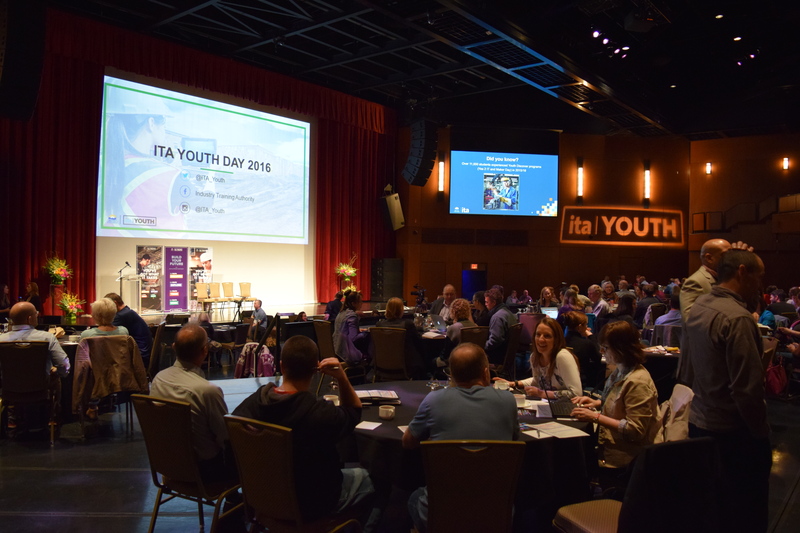 Jason Leber, ITA Youth Program Manager, hosts ITA's Youth Day 2016. 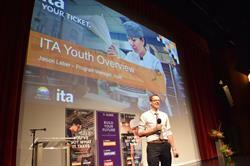 ITA Youth Day 2016 participants gather to share best practices and insights on promoting the skilled trades to British Columbia's youth. RICHMOND, BC--(Marketwired - November 24, 2016) - The Industry Training Authority's (ITA) 11th annual Youth Day conference was held yesterday at the River Rock Theatre in Richmond, and brought together more than 170 educators, career counsellors, employers, tradespeople and industry representatives to learn from female tradespersons first-hand about their experiences, and to share best practices, insights and opportunities for young people in the skilled trades. 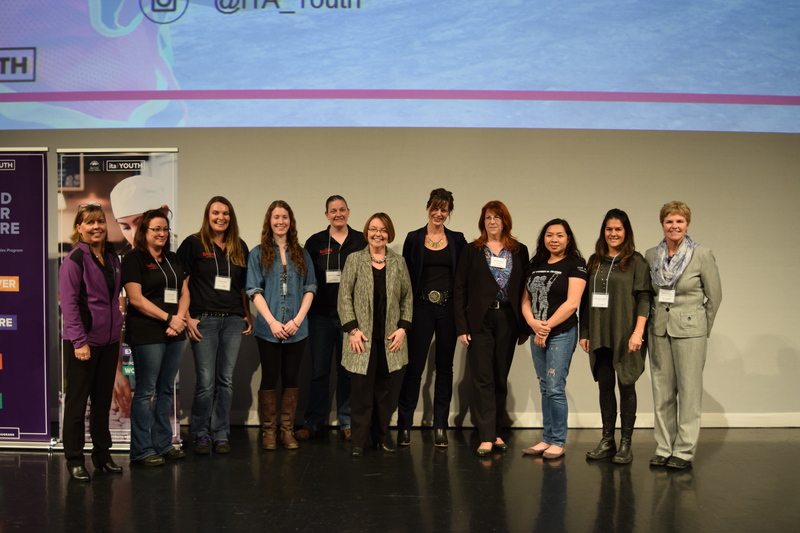 This one-day conference included a keynote speaker, a workshop on promoting females in non-traditional trades, round-table discussions on timely subjects, an update on ITA Youth Programs, and a session highlighting innovative and sustainable trades programming. ITA has made progress in recent years increasing the representation of women in the trades and we know there is still more work that needs to be done. Females currently comprise just under 10 percent of all registered apprentices in ITA's apprenticeship system to date, and with so many lucrative trades paths for women ITA continues to look at ways to remove barriers to entry and increase women's participation in the trades. The keynote speaker, Jamie McMillan, an Ironworker from Ontario who started the Journeyman™ initiative and kickasscareers.org, kicked off the day by speaking about how she found her passion for the trades, what she has learned along her journey so far, and how she is inspiring women to pursue skilled trades careers. Jamie is now an advocate and mentor for female tradespeople through the Journeyman™ initiative. Conference participants were also able to learn about updates to ITA youth trades training programs, which were announced in September 2016. The updates were implemented to ensure youth get an earlier introduction to trades certification, yielding better outcomes, including higher transition rates into full apprenticeships and careers in the skilled trades. To help implement these program changes, the BC government committed an additional $7.8 million from Budget 2016 to ITA over the next three years. In partnership with the Ministry of Education, ITA's youth strategy builds off of the recommendations from B.C. 's Skills for Jobs Blueprint to increase the number of students entering the skilled trades, and to ensure students embarking on their trades journey have all the support and skills they need to be successful. "Educators and counsellors make enormous contributions to students who are making choices about their future careers. One of our priorities is to give students and their parents better information on the many career paths available, and our updated youth apprenticeship programs reflect that goal. Youth Day is our chance to get together, celebrate our youth, and share ideas to continually improve the apprenticeship system in B.C." "Building a skilled workforce for the future depends on the youth of today. 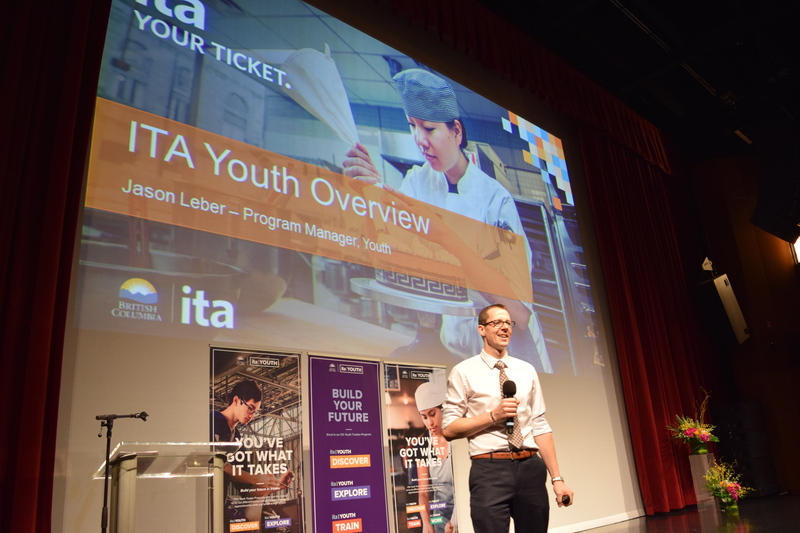 ITA is committed to providing youth programs and leading youth initiatives that expose young people to the opportunities available in the skilled trades. Events like this allow us to collect valuable feedback from the trades training community to set up the next generation of tradespersons for success."